This is one of the requested features from services having multiple educators. You can now create custom roles in your App and assign educators to these roles. This now allows you to name the roles based on the names you call them in your centre, as well as adjust the permission and access levels for these roles exactly the way you want them. When creating custom roles, you can either inherit one of the default roles and only edit the permissions you wish to change or you can create a custom role from scratch. This feature gives you a lot of flexibility which is the main aim for Appsessment, so you can set up your service app the way you want it. 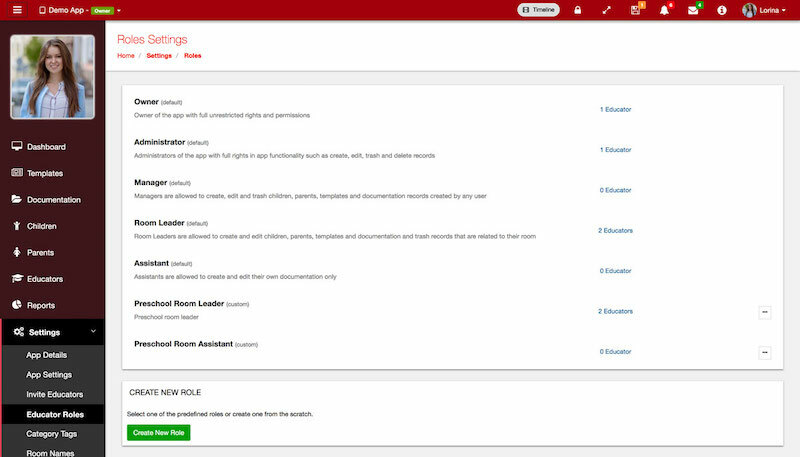 You can create custom roles by going to your App's Admin Panel -> Settings -> Educator Roles. Publish Documentation - whether to allow educators to publish documentation. Send Parent Input - whether to allow educators to create Parent Input forms and send these requests to parents. Send Parent Reminders - whether to allow educators to send Parent Reminders from your App. The App notification system has been enhanced with some new changes. Now, every time a documentation is created, a notification will be sent to all educators who have permission to view that documentation. Previously, it was set to only send notifications to the documentation author or room leaders, but educators with administrators or manager permissions were not notified individually. This behaviour has changed so all educators who have permission to access that documentation is now notified on all changes and updates posted by other educators or parents so they are aware of all activities happening in their App. Of course, you have the ability to disable email notifications in your profile settings if you only wish to receive in-app notifications and not email updates. When sending private messages and if you are selecting multiple recipients, you now have the option to select whether you want that as a group conversation or keep it private for each individual recipient. Sometimes, you may wish to send private messages to all parents but at the same time, you do not want the conversation to be held as group where everyone can see the replies. With the new update, you have the option to select "Group" or "Individual" which appears in the Compose Message screen when you select multiple users. If you select the "Individual" option, the private messages will be sent individually to each recipient so your conversation is separate from each other. This will be a very handy feature when you want to send the same private message to everyone and yet wish to keep each conversation separate for each user. We have changed the way the 'Educators Only' documentation works. Previously, when you create documentation and mark them as "Educators Only", that documentation will not be visible to parents and with educators its only visible to users with Administrator or Manager roles or for Room Leaders if it is linked to one of their children. However, we have changed this behaviour slightly so these educators only documentation can be viewed and accessed by all educators unless it is linked to any specific children. In other words, if the documentation is not linked to any children, then all educators will be able to view the update marked as 'educators only'. If it is linked to some children, then only the educators who have permission to view those children can see these updates. We feel this behaviour is more appropriate and as a result we have enhanced this feature with these changes. The activities listings, parent inputs and parent reminders that show in parent profile page have been enhanced with some changes. With the new updates, the parent input will also show the list of requests that were sent to that parent and also these are shown in parent profiles that are still pending activation so you can keep a track on all updates sent to a parent along with their activities. Previously, educators who have permission to only view documentation related to their room cannot view Parent Input or Parent Reminders created by other educators even if its sent to parents from their room. We have enhanced these permission checks so now educators such as Room Leaders can view all documentation that is linked to parents from their Room and not just children documentation alone. You can now copy and create a duplicate of Parent Form requests as well as Parent Reminders from your App's Admin Panel. This allows you to quickly create multiple copies of these updates and edit only the ones you wish to change. We have optimised the Children pages, Parents pages and the Educators pages so they are loaded more quickly and faster than before. So centres with a lot of children, parent and educator profiles will find that it is quicker to open these pages in your Admin Panel. The above is not an exhaustive list and we have included a lot more improvements, fixes and updates to our App. We have also updated our Mobile App that includes a fix to some iOS devices that had issues when uploading photos. If you are using our Mobile App, you can update your Appsessment App from your App Store or Play Store. This update has a lot of changes to Appsessment and overall the main highlight in this release is the ability to create Custom Roles and the way the permission and roles works. As a result, you may see some changes in the behaviour of the notifications you receive and the documentation you see in your Admin Panel. Appsessment is improving every day and becoming more adaptive to various centre sizes and requirements. We hope you find these updates useful and we have a lot more exciting releases scheduled next. If you are yet to try Appsessment, get started today with 14 days money back guarantee period. Thank you all for your support in shaping Appsessment to be a perfect Documentation App for educators.